I've seen it on Craigslist. I've seen it on adoption support forums for mothers. I've seen it on Yahoo answers and I have heard anecdotes about it happening in public places such as restaurants and department stores. Trolling for b****mothers...it could be a television show. Those leading questions you see on Yahoo Answers about "how do I go about adopting in (NY, GA, MO and Ratsass, NE)?" or "what does it cost to adopt?" are all just hooked worms dropped into the waters of the Internet with hopes that someone will bite. Let a young, unexpectedly pregnant woman, bewildered and frightened, post about her problem anywhere and the PAPs are on her like...well..like a pack of hyenas. They are predators and their game of choice is the fecund woman with the womb-fresh, healthy infant. Not only do these people indulge in this kind of predatory practice, they are encouraged to by agencies like Bethany Christian Services. They even have a stable of good, pious little beemommies to tell the prey how wonderful it is to turn your own flesh and blood over to strangers. If anyone wants to know how to track and bring down the succulent pregnant prey, there is a heinous book, "Fast Track Adoption," written by adopter "Dr." Susan Burns. The link takes you to a story about what happened after her book was published and the mother of the child she had adopted realized what she had lost and how she had been used. We older mothers have beat our heads against that brick wall so many times, trying to dissuade the young women of today from falling for that crap, that some of us have decided to give it up and concentrate on our own issues. The PAPs and agents and beemommie shills are quick to assure their victims that we are just bitter and that things are no longer the way they were. I often wonder what part of "same stuff, different day" these kids don't understand. If I had been given the options they have today, such as birth control, safe, legal abortion, and keeping without stigma or shame, I wouldn't be blogging this subject today. It boggles my mind. To offset these recognized civil rights, the industry has lobbied for and won harsher laws advocating everything from binding pre-birth surrenders to 24-hour recinding periods. I noticed a page on Facebook where adult adoptees were really slamming natural mothers. I also got some insight into the ages and situations of some of these hostile people. Our adult children are in their 40's and up. We BSE mothers are in our 50's, 60's and 70's. It's not our children, for the most part, who are making these hateful comments. It is the later generations and their mothers are the women who ignored us as "bitter and angry," and thought they had it all under control. Now, these same mothers are recognizing that the attack of the predators may have been more subtle and wrapped in pretty bows, but the teeth were just as sharp. These mothers will also have to face the sharp words of their adult children. You see, the mothers of the BSE/EMS were not blessed with the choices of later generations. We had one option and one option only and our adult children have, for the most part, learned that fact and are exploring their feelings based on the truths they have acquired. But, especially considering the change in society after the mid-1970's, these adoptees from those years are asking the hard questions. It's difficult for them to understand how an industry powered by the money their adopters paid, has so brainwashed a nation that their mothers were ripe for predation. And, lest they forget, adoption is government sanctioned. As such, it has become an institution right up there with the flag, baseball and apple pie. It is distressing to see the PAPs and Agency reps wading through the waters of the Internet, dangling their bait and waiting to see who bites, so they can set the hook and reel her in. It doesn't seem sporting because I have noticed that the prey is outnumbered, overpowered and doesn't put up much of a fight. These new moms have had too much Dr. Phil and not enough reverence for family ties taught to them. If anyone wonders why we are approaching from the base of the structure in order to weaken it, it's because the part that shows is all sweetness and light and the ugliness is in the roots, hidden and covered with the dirt of decades. So while the hyenas hunt, we are chipping away at the roots of the tree under which they find shade and sanctuary. 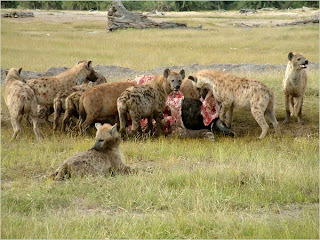 Actually, I feel like I am insulting the hyenas. They are only doing what they must to survive. I've seen plenty of people survive and flourish without children. What a concept. And, now that adopting is encouraged, even among the fertile, those who have already had their own children, it makes me wonder why the women of today feel they have missed out if they don't adopt. The wannabe Angelinas and Madonnas are everywhere. It's more than an obsession. The desire to adopt has become a disease and the ones who suffer from it are the mothers and the adopted children. The carriers go on their way, predators after prey, disrespecting the most primal bond there is in favor of faux sainthood and self-entitlement. Big Oil left its mess in the gulf. Big Adoption leaves its mess in the broken hearts of mother and child. That's the bottom line, for you. Predators out all over the place looking for a baby even after raising their own. WTF? As a grandmother I have no desire to adopt a baby or a child. But of course, I have lived with the pain of adoption. I am not entitled to adopt just because I can, or want to raise another child. Let's get real predators,pap's or Angelina or Madonna types..the woman that adopts for attention from media for the two latter types they need to be in the limelight need to say look at me I am wonderful free publicity. For the predators and paps its their needs and the baby is secondary. Its ownership alive and well in our materialistic society. The entitled. I want a baby, and I am entitled to have one..its about me and only me. I read about a concert up here in Seattle so this couple can adopt a child an "orphan" (found it interesting they had to add that maybe there are those who are questioning the almighty act of adopting) they explained in the newspaper. They had a concert and had learned how to make it even better this year so they can make the $30,000 plus needed to get the "orphan". Made my skin crawl don't even trust that it is an "orphan" nor do I trust those who raise money that way for adoption predators of a different sort financing adoptions with concerts. Living with what "GOD" gives you such as not being able to have a baby is not even in the scheme of things. My sis is one of those she has no children and guess what she survived. She is a wonderful woman hands on aunt and great aunt. It can be done. It just takes a person who doesn't think she needs props or to tell the world look at me...aren't I special...look I am wonderful.She truly is special what a novel approach helping other women her sister with kids, other women with kids. Not having to buy a child to make her feel whole or needed. Agreeing with every word here.All sad but true. "To offset these recognized civil rights, the industry has lobbied for and won harsher laws advocating everything from binding pre-birth surrenders to 24-hour recinding periods." Even before they lobbied for these things, they often found a way around the laws... They're lying, sneaky, deceitful people. When I was adopted in 1976 in South Carolina, the adoption was handled privately. My birth mother was slightly aware that the law in SC says that SC born children MUST be placed with SC couples. (It does; I was shone a copy of the law once by a friend and activist.) Being 16 when she gave birth, her mother controlled everything. She told me she was told to sign a bunch of papers that she wasn't allowed to read but she noted that one they (her mother and the lawyers) were making her sign said the couple could take the child (me) out of SC. She questioned this and was told that the couple was from SC and they just wanted to be able to take me out of state to visit family. The truth was that my aps were always from NJ. No one ever bothered to tell my birth mom that. She was always told they were from SC. For the 21 years were separated, she believed I was somewhere in SC - never knowing I had always been in NJ. And another example in my own adoption? My aps had been chosen by CSS in NJ to adopt another baby prior to me, but the adoption fell through. The birth mom changed her mind. When the chance to adopt me was presented to them, they told the lawyer about their previous experience. The lawyer asked them to have their priest write a letter to their character. She (the lawyer) gave it to the judge handling my case. He decided that because of this letter, he would finalize my adoption 3 days after my birth. This is clearly against SC law which states that the birth mother (at that time) had a 6 month period to change her mind; and that although I could have still gone home with my aps, a home study should have been done to ensure that I was being placed in a proper home. The judge waived all of that; deciding it was not necessary (based on this letter) and that my birth mother didn't need to have the right to change her mind! Imagine the trouble all this could have caused if my bmom had decided to challenge the legality of my adoption when she was a little older? I think I could have been another baby Jessica (DeBoer). *Just me, Both my children were surrendered and adopted in SC and remained there. I was not aware, until reunion, that it was the law that children placed in SC had to be placed with SC residents. I wonder, though, if it is then legal for the adopters to move from the state as they wish?